The Chevrolet Vehicle Locate app sends text alerts when a vehicle leaves an area designated by the owner. General Motors is launching an app-based feature that will locate an owner's vehicle on-demand and send text message alerts when it leaves or enters a preset 20-mile radius. The "Vehicle Locate" service is available to owners of eligible 2012 model-year or newer Buick, Cadillac, Chevrolet and GMC vehicles in the U.S., Canada and Mexico. Depending on the time of the vehicle's purchase, the service is either free or part of a $14.99-a-month OnStar plan. GM is launching the service this week through the owner's vehicle app for each brand, following a beta release in mid-December. The feature replaces the Family Link service, which was solely web-based. When setting up Vehicle Locate, users can create boundary areas, as wide as a 20-mile radius or as small as a specific address. They can select up to 10 people to receive alerts when the vehicle enters or leaves that designated area. 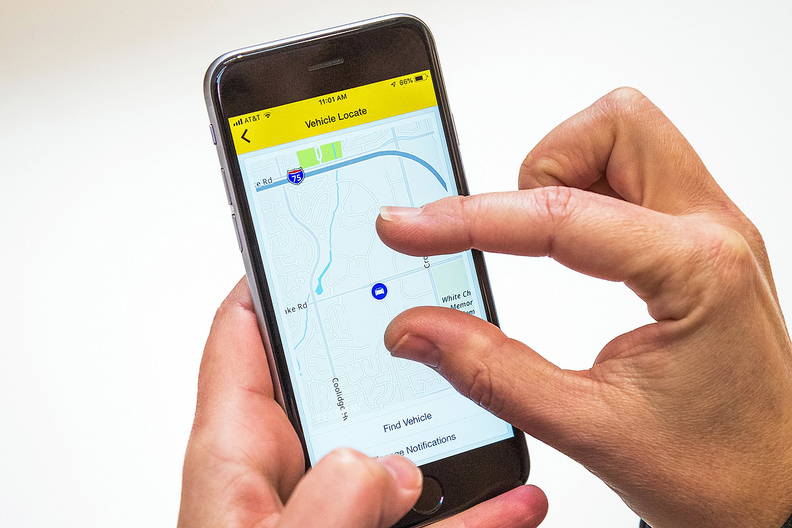 Alejandra Gonzalez, GM product manager of Remote Services, touted Vehicle Locate as providing drivers and their loved ones "with peace of mind in a variety of different drive-related scenarios." Uses identified by the company for the text messaging include hands-free notifications for family and friends when the driver is getting close to home and monitoring of friends or children when they drive an owner's vehicle. GM first started discussing the text message alerts more than five years ago to assist parents in monitoring teen drivers through OnStar. The feature, as a result of GM's repositioning of OnStar last year, is included with any paid OnStar plan for owners who purchased their vehicle before May 1, 2018. It starts at $14.99 per month as part of a "Remote Access" plan for owners who purchased a vehicle on or after that date. The paid plan also provides features such as remote key fob services to remotely start, stop, lock and unlock vehicles, and on-demand diagnostics to troubleshoot common issues.